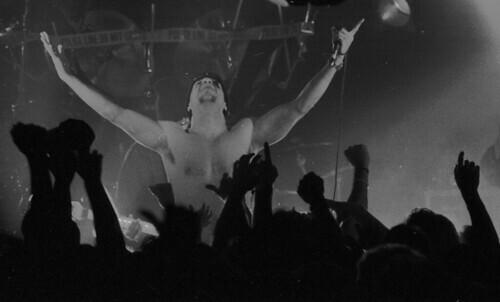 Just for the hell of it this is a picture I took of Ice-T fronting his band Body Count at the club Rocky's in Charlotte, NC. This was in December 1992. It's still one of my favorites. It really should get stolen more. I love the architecture of classic old motels and this one is a nice example. 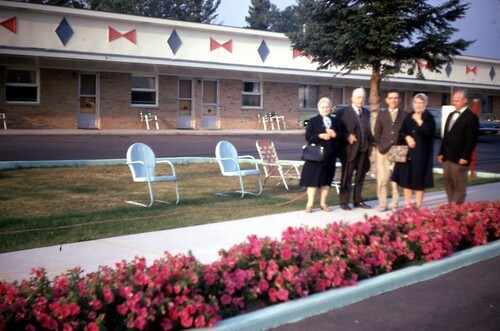 It was taken in 1966 and it's likely a hotel in Northern lower Michigan. The vintage metal lawn chairs are a nice touch. This is from a set of vacation slides from some family's trip to Michigan in 1966. 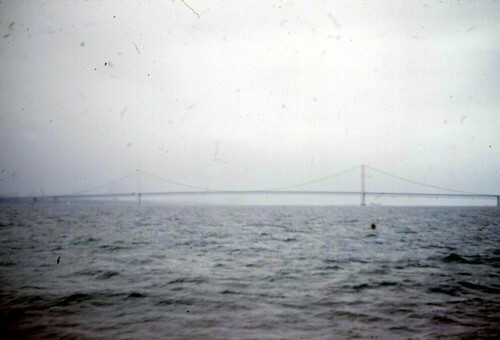 This shot of the Mackinac Bridge was likely taken on a ferry taking our vacationers to Mackinac Island. I think. I'm not sure. 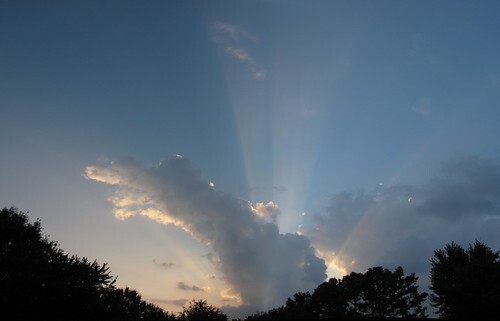 Today Melanie and I visited her mother and as we were leaving around 8pm we were treated to these nice sunbeams shooting out from behind the evening cloud cover. Pretty cool. I had to stitch two photos together to get the whole view. This weekend Melanie and I traveled down to northeast Georgia to visit with her brother in law's brother and his wife. We traveled down with her sister and brother in law. This is the third time that Jon (Mel's brother in law) and I have taken advantage of a family outing to play a round of golf. In fact, two years ago when I played with him and his church group in Winston-Salem at Pudding Ridge my bad playing inspired me to put some real effort into not sucking. This time Jon's brother joined us and he hadn't played in six years. He struggled early but started getting his groove back halfway through the first nine holes. We started at 8am this last Saturday morning and at 8am in early July in Georgia it's already pushing 80. It was really hot by 10am. I drank a lot of water and sweated like crazy. But we made it through all 18 holes. I was really feeling the heat at the turn but I chugged a lot of water over the next three holes and was feeling a lot better for the last five holes. Playing 18 holes of golf is like watching the Coca Cola 600 NASCAR. It feels like you go through about three or four stages of play as the day passes and your game fluctuates. The course, which is known officially as Highland Walk Golf Course at Victoria Bryant impressed all three of us as soon as we stepped out of the car. It's in high country and from the clubhouse area you have a good view of the surrounding countryside. Our reservation had been made in advance over the internet by Jon's brother Mike and we paid $40 each to play 18 holes with a cart. I thought that was a great deal once I saw the great condition of the course and the course design. There are three things to really know about this course: elevation change, doglegs and challenging greens. A great example of elevation change and doglegs is hole #3. We played the white tees and this hole was 391 yards from there. There is little margin for error on this hole. If you go right you are a mile away from the green, if you go left you are in the woods and if you don't get a good long drive you are facing a tough uphill lie with woods between you and the green and if you aren't careful you can end up on the woods with your long second shot because the fairway pulls hard right to left almost until you get up to the green. Also, the course doesn't use doglegs to artificially add a stroke to a short hole. The holes take to their turn far enough down the fairway to reward a good drive and punish a short one. This picture below shows a good example of what I mean. This is the view from the tee at hole #5. You have to hit over a valley onto a relatively small landing area. I had one of my better drives here and had a nice look at the green. Of course, I hit my 4 iron right into the woods to the left of the green. Below is a graphic provided by the golf course. Another doozy is #12. This one reminded me of the old #9 at Revolution in Charlotte, NC. You have to hit through a tunnel of trees onto an elevated fairway. In honor of the old #9 at Revolution I went ahead and hit my tee shot directly into the woods. Jon, who you see standing below in the panorama nailed his tee shot to about where you can see the golf cart. If you get a good tee shot you are looking at an elevated green about 150 yards away. Par here is as good as a birdie. The 17th hole is their signature hole and you are way, way above the fairway when you tee off. Your ball just flies and flies and flies. If you hit it straight you will be about 100 yards from the green. I have to mention the greens. The greens are really tough. They are hard as hell to read and they are super fast. I've never misread to many puts before. Jon said he thinks it's because courses in Georgia are inspired/compete with Augusta. That may be true because two putting here consistently is extremely difficult. I would love to play at this course again. I would go there in a second. For a public course on a state park it blows away all of the public state owned courses in Charlotte. The design and condition is as good or better than Emerald Lakes in Matthews, NC. Renaissance in Charlotte has a design on par with Highland Walk but it's not nearly as well maintained. I can't imagine playing a better course for a mere $40. It's perfect. 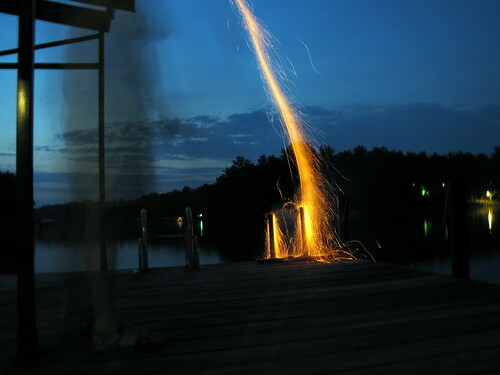 What would the 4th of July be without a couple of pictures of bottle rocket trails? 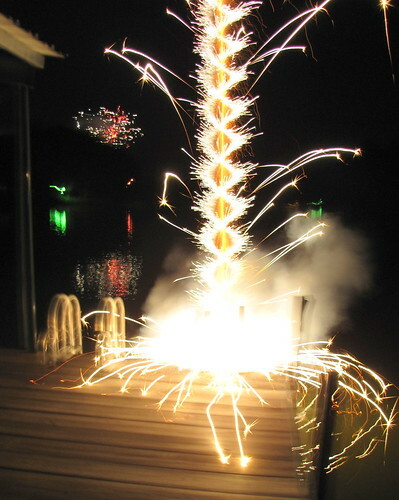 This one isn't really a bottle rocket. It's pyramidal shaped spinner that we like. Today we are in Lavonia, GA at a house on Lake Hartwell. This is the view off our friends' dock.